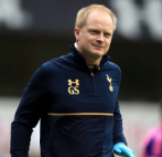 GEOFF SCOTT is well known in the sports physiotherapy community and has been the Head of Physiotherapy at Tottenham Hotspur, since 2004. Previously to this role he worked at Fulham Football Club. Originally from New Zealand, he worked in many codes such as Rugby, Rugby League and as well as with individual Olympic athletes before choosing to dedicate his time to football. His clinical interests are combined with injury analytics using data driven models to highlight susceptibility or prevent future injuries using a range of objective data. He holds an MBA from Warwick University after completing a dissertation in injury predictability in footballers based on the injury data collected from thousands of football injuries.